The recent talk about mascot surveys led Adrienne Keene to muse about doing her own survey. On her Native Appropriations page on Facebook, she wrote:I just had an idea to use some of my school resources (i.e. fancy survey software) to make a survey that can counter the Sports Illustrated and Annenberg polls about Indian mascots from the early 2000's that are always cited in these articles! Any suggestions or ideas on what to ask or how I should word questions? Should have taken that survey design course this semester...I and several others responded. As usual, their responses are indented and mine aren't:How about a yes/no on offensiveness, a multiple-choice follow-on with reasons why or why not, and a Native/non-Native demographic question? Also a survey professional and would be happy to be another set of eyes on wording.It would be tough to get a random sample of Indians. As you know, something like 70% of Indians are urban rather than rez-based. Some percentage of rez-based Indians don't have phone or Internet service. Then there's the problem of whether you count Indians who aren't enrolled. And those who identify as multiracial (Indian plus at least one other race). This is like Flaw #1 in the Sports Illustrated poll. There's no clue about how they identified and located the so-called Indians in their survey. To me the key is going beyond the basic "Do you find Indian mascots offensive?" question. For one thing, this question puts the onus on the respondents. In their minds, they may translate this to, "Am I an overly sensitive whiner who can't take a little ethnic byplay?" And they may respond, "No," as in "No, I'm a proud warrior who doesn't let anything bother me." For another, respondents often want to please the questioner and not rock the boat. I suspect Indians are as prone to this as anyone, if not more so. Do you find Indian mascots offensive? Some people feel mascots honor Indians. Do you agree or disagree with this and how strongly? Some people feel mascots portray Indians as primitive savages who lack culture or religion. Do you agree or disagree with this and how strongly? Scientific research shows that Indian mascots make Indian children feel worse about themselves. Does that affect how you feel about such mascots? The most popular sports mascot names include Eagles, Tigers, Panthers, and Indians. How do you feel about being compared to a predatory beast? If someone portrayed you as a half-naked warrior threatening people with a tomahawk, would that bother you? If someone called your parent or child a "redskin," would that bother you? 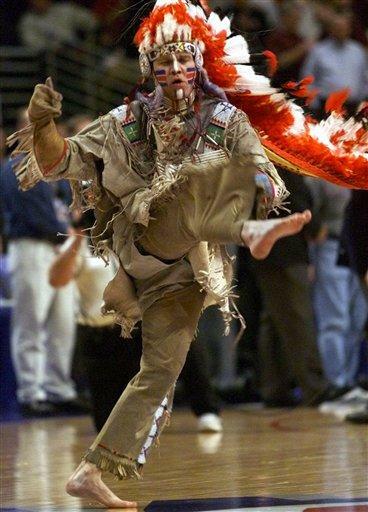 If you had the power to change a mascot that many Indians find offensive, would you do it? Obviously these questions are biased toward the anti-mascot position. You'd probably want to tweak them to make them more "neutral." And narrow them down to a manageable set of 3-5 items. My point is that the basic "Do you find Indian mascots offensive?" is biased toward the pro-mascot position. Why? Because it doesn't probe the depth of understanding about mascots. It doesn't bring out the issues that activists know about but regular people don't. The silly things mascots and their fans do...the research...the comparison to animals...and so forth. Not making these points clear is why many people find it easy to support mascots and ignore the criticism of them.I'll toss this out to the other survey folks here--can one purchase a list of Indians to survey? I recall that we used to buy fairly specialized lists, but I don't remember Indian lists. I suspect that--if such a list/sample could be obtained--funding would be fairly easy to obtain.For sampling, I wonder if there's some way to tap into the Census data. That might be the best source of data about who is or isn't an Indian. I think a lot of people, including Indians, take the blandishments of sports teams and their fans at face value. They think, "These teams say they're honoring us. And their mascot is a noble chief or warrior. Who am I to disagree with millions of people?" That's why you want to probe below the surface. You may want to show people pictures and base some questions on them. For instance, "This is Chief Wahoo, the mascot of the Cleveland Indians. Do you feel it fairly represents you as an Indian?" This survey would be a good project for a class on research methods. One group of students could tackle the sampling issue. Another could tackle the list of questions. And so forth. Or a Native studies class could partner with a research methods class to do this survey. It could extend across different departments or even different schools. It could turn out to be a big project, so you could use the extra help.Would you wear shirts/hats/jerseys and put bumper stickers on your car for the Atlanta Negros or the Cleveland Ragheads, with accompanying caricature logos? Would you feel OK spending money with one of those franchises? Why or why not? Do you think the African-American or Middle Eastern communities would be as passive about such mascots as the Native Americans have been? Do you feel if there isn't significant pushback that its ok? What does "significant" pushback look like to you? How would you feel if either of those teams represented your city/town/state on the national stage? Just a side note, this use of Native American imagery reaches far beyond just sports. State flags, butter, baking products, video games, tobacco...just to name a few. Why not target all uses of these images and not just sports? How do you feel when you see an "Indian" mascot? And then list positive, neutral and negative emotions for them to circle. Or what thoughts go through your mind? And do follow-up interviews to probe any contradictory answers. For instance, if they don't find Chief Wahoo offensive but do find the other images offensive, why? It also might be good to compare the mascots to hipsters, models, or starlets in headdresses--the trend we love to hate. If respondents say a prancing mascot isn't offensive, how about a prancing hipster in a headdress? And again, what's the difference? It can't be the alleged "honor," because hipsters also claim they're honoring Indians. Get their response to the obvious point that both pseudo-honors are the same. P.S. Adrienne has written about the butter, baking products, and so forth before, of course. But I'd say sports mascots are among the most blatant offenders. I think it's smart to focus on them first. If you can get multimillion-dollar sports franchises and their fans to give up their mascots, the rest of society will get the message. Comment: For more on the subject, see The Sports Illustrated Poll on Mascots and Team Name and Mascots. Individual census data is sealed for something like 72 years. While you can access aggregate data that tells you what percentage of respondants identifies as a particular race, occupation, etc., you won't be able to find out who individually answered that way for decades. I think the overall idea of trying to do a new survey is an excellent one,though, and I agree that simply asking if you find such-and-such to be offensive doesn't go deep enough. Doesn't the Census organize its data by blocks, neighborhoods, or zip codes? I was thinking of something like that, not of identifying individuals.